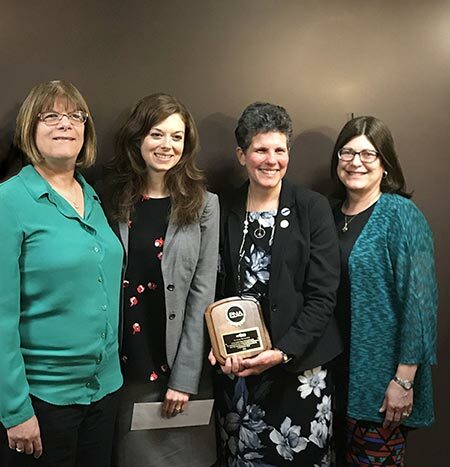 May 10, 2018 - Stone Ridge, NY – The SUNY Ulster Nursing Program was presented with the 2018 Professional Nurses Association of Ulster County (PNA) Honorary Recognition Award at their annual awards dinner last night in Kingston. The PNA Honorary Recognition Award recognizes an agency which has rendered distinguished services or valuable contributions to the nursing profession. This award comes as the nursing program celebrates its 50th anniversary of service to the Ulster County community. "We are pleased to be recipients of the 2018 Professional Nurses Association of Ulster County Honorary Recognition Award as our Nursing Program celebrates its 50th anniversary. Thank you to our faculty and staff for their contributions to our program throughout the years and to our students for choosing SUNY Ulster for their nursing education." The Nursing program at SUNY Ulster was founded in response to Benedictine Hospital (now known as HealthAlliance Hospital) closing its hospital-based nursing program. The first class, consisting of 24 students, graduated from the program in 1970. Since the nursing program was founded in 1968, 1,920 nurses have graduated from SUNY Ulster, contributing greatly to the health and wellbeing of our surrounding communities. Throughout its 50 years, the program has maintained an innovative, forward-thinking approach in preparing students to meet the region’s healthcare demands with its state-of-the-art Elizabeth Tucker Nursing Skills Lab and the Gavner Simulation Center. SUNY Ulster also forged a partnership with Empire State College in advance of Governor Cuomo’s BSN in Ten law to offer a blended format R.N. to B.S. Program through which registered nurses in the region can obtain their bachelor’s degree. One student in the R.N. to B.S. program is Adrielle Sutton who received a scholarship from the PNA last night.